t*rexes and tiaras: Friday Favourites 074.. I can't believe that the sales have already crept up on us. I think they have done this for the past couple of years, now, but it does seem weird to me for the sales to be on before we've even had Christmas. Not that I'll get a chance to hit the shops for a while, but this dress and clutch are one of the outfit combinations I've been considering for New Year's Eve. It seems only right to start the new year in a new dress, doesn't it? 001: I seem to be having a bit of a jacquard moment, at the moment. I've bought a dress and a skirt in jacquard recently and I'm kicking myself for getting rid of a silver jacquard skirt which I think I may have sold on last year, thinking I'd not wear it again. Gah. I hate when you remember things you used to have and wonder why you ever got rid of them. This dress looks rather perfect, though. 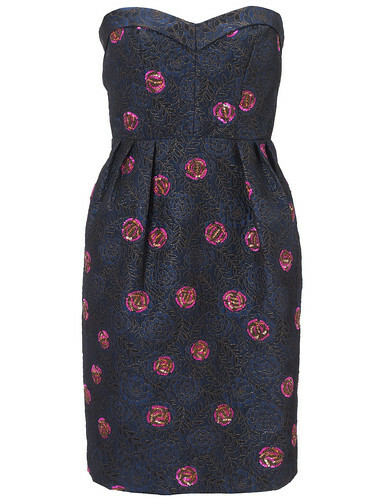 Jacquard, nice bright colours and a floral print. Win. 002: I think this clutch caught my eye a little while ago. I'm quite taken by the snake detail and think it would make a lovely statement. Plus, I don't take a lot with me on a night out, so it would be totally big enough for all of my essentials. What do you think? Would this work for a NYE outfit? New year, new dress - seems only right for sure!! I really love the dress, the little roses are really cute! That dress print looks very Art Nouveau like William Morris designs. Very chic. Can't beat a rather smart snakey clutch either. 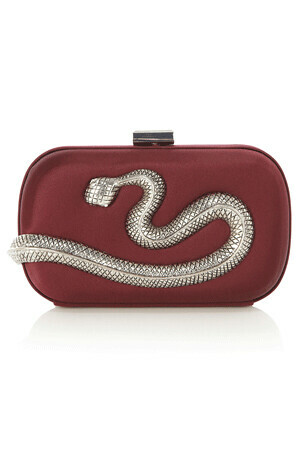 Ooh, that snake clutch is pretty rad. That snake clutch is AMAZING. Loving that dress, it's gorgeous.